The nation celebrated the 49th Independence and National Day on Tuesday with a fresh vow to take Bangladesh towards prosperity with the Liberation War spirit. On March 26, 1971, Father of the Nation Bangabandhu Sheikh Mujibur Rahman declared Bangladesh’s independence following the crackdown on unarmed Bangalees on the midnight of March 25 by the Pakistani occupation forces. After the nine-month War of Liberation with the supreme sacrifices of three million martyrs and the honour of two lakh women, Bangladesh achieved its cherished independence on December 16, 1971. Different sociocultural and political organisations celebrated the day with elaborate programmes. National anthem 'Amar Sonar Bangla' was sung simultaneously across the country and Bangladesh missions abroad in the morning. Prime Minister Sheikh Hasina led the nation in singing the national anthem at the main programme of 'Jatiya Shishu Kishore Samabesh' held at Bangabandhu National Stadium. The President and the Prime Minister placed wreaths at the National Mausoleum at Savar at dawn. Prime Minister Sheikh Hasina also paid tributes to Father of the Nation Bangabandhu Sheikh Mujibur Rahman by placing a wreath at his portrait in front of Bangabandhu Memorial Museum at Dhanmondi. President Abdul Hamid and his wife Rashida Khanom hosted a reception at Bangabhaban on the occasion. The national flag was hoisted atop government and private buildings while the government and semi-government buildings and other public places were illuminated. 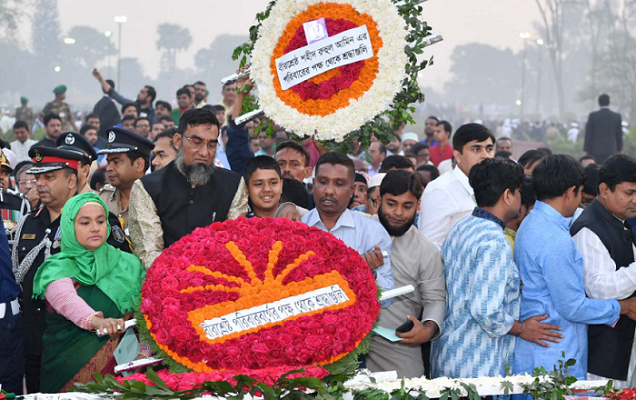 National dailies brought out special supplements while Bangladesh Betar, Bangladesh Television, private radio stations and television channels aired special programmes highlighting the significance of the day. Special prayers were be offered at all mosques, temples, churches and other places of worship across the country seeking divine blessings for the eternal peace of the departed souls of Father of the Nation, four national leaders, martyrs of Liberation War and all other patriotic sons of the soil. Improved diets were served to the inmates of jails, hospitals, old homes and other public institutions to mark the day.